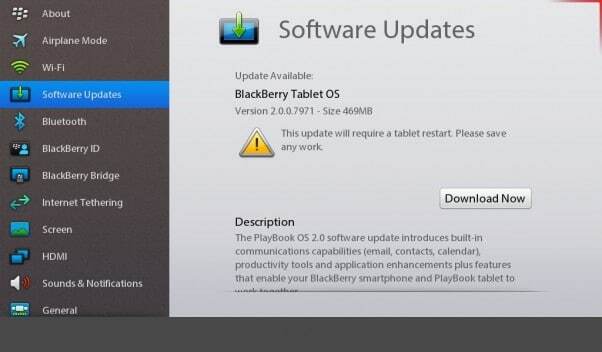 RIM on Monday released the awaited since 2011 PlayBook OS 2.0 update. Now you can use your PlayBook more with the features the updates brings rather than having it as a digital photo frame. PlayBook OS 2.0 is considered the first major update the PlayBook has received from RIM ever since the tablet was released back in 2011. The OS 2.0 update introduces many new basic features for the PlayBook users were waiting for such as native email, calendar and contacts, Facebook, Twitter, Linkedln integration. You will now be able to enjoy Android apps with the added Android App Player via BlackBerry App World. And if you own a BlackBerry smartphone, you can pair it up with the PlayBook via the new updated Bridge app and use its functions. You can easily update to PlayBook OS 2.0 by tapping the notification to view update details, selecting download and follow the introductions.